The PMA Educational Foundation (PMAEF) received a grant from the Hitachi Foundation in 2011 to identify and develop case studies of employers in the metalforming industry that excel as successful businesses, through enhanced values, culture, policies, practices and investments. These are companies whose success fosters and is driven by skill enhancement and advancement opportunities for their production employees. The ultimate goal of this project is to foster direct engagement with other employers in the industry with similar values, culture, policies, practices and investments that strive to meet similar goals of good businesses and good places to work. As a result of these practices, these companies are creating paths to reach higher levels of business success, and to also increase the earnings and skills of their lower-wage employees. 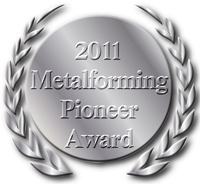 To identify and recognize these excelling metalforming companies, PMAEF has created the Metalforming Pioneer Award, and is collaborating with MetalForming magazine in an effort to tell the stories of these successful pioneer businesses. PMAEF also is partnering with The Manufacturing Institute, which is assisting with pioneer company identification, evaluation and promotion. I hope you enjoy reading about these three companies in the following pages; they truly exemplify the principles of the Metalforming Pioneer Award. Their stories also will be told through other media outlets, including those of The Manufacturing Institute and Hitachi Foundation. And, we plan to present these pioneers’ stories in follow-up live events, roundtables and webinars in which other metalforming companies will be invited to participate and learn. The next round of pioneer company identification is under. If you are a company that meets the criteria, or if you know of one, please contact me directly at dsansone@pma.org to learn how you can be recognized.